Our grandmothers made chicken and dumplings all the time like it was nothing. One would appreciate a little begging before she got out the flour and the milk; the other shrugged and made just dumplings after 3 of the grandkids went vegetarian at the same time. We love our sweet grandmothers, and we got a huge part of our love of cooking from them. This is a dish that really brought us back. In a food processor, pulse the carrots, celery, pepper, and garlic until evenly chopped. (This helps extract more flavor from the vegetables.) Over medium heat in a large soup pot or dutch oven, brown the diced onion in a few tablespoons of olive oil. Add the bouillon cube and stir. Add the remaining ingredients and simmer for 30-45 minutes. Strain and set aside. In a large soup pot or dutch oven, melt two tablespoons of butter over medium high heat. Toss the seitan with the flour, and then sear the seitan in the butter until crispy. Turn once and brown the other side. Add a pinch of garlic powder and black pepper. Pour stock over the seitan and reduce heat to low. In a medium mixing bowl, mix dry ingredients and then the wet ingredients; stir just enough to mix because if you stir too much, the dumplings will become tough. Bring the six cups of stock and chicken up to a slow boil. Drop dumpling batter into stock one spoonful at a time. You should have 10-12 dumplings. Place lid on soup pot and reduce the heat to simmer for 15 minutes without disturbing the pot. This is the garnish for the dumplings: dice a carrot, celery rib, and 1/8 cup of parsley, and then mix diced vegetables with a drizzle of olive oil, a splash of champagne vinegar, a pinch of sugar, and a pinch of salt. Mix to incorporate. 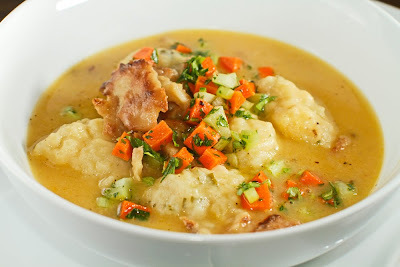 To serve, spoon 2-3 dumplings and a few pieces of seitan along with some broth into a soup bowl and garnish with the fresh vegetable mixture. I really love your blog! I became a fan when doing research on Memphis for a vacation I took there this summer. I'm just wondering what brand of 'chicken' style seitan you used? The only kind I've found is usually in strips or patties. 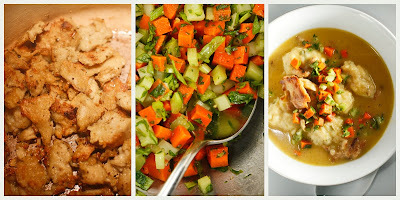 This will be a great recipe to make on a cold Chicago day! I'm not much for meat subs, but the White Wave brand of "chicken style" seitan is the best in my opinion. chocolategirl64, they have Quorn brand "chik'n" in the UK I believe. The texture is a bit different though. Justin, I've tried chicken and dumplings before and failed. Well, my husband liked it, but I didn't. I'd like to try this one, but I'm allergic to celery. I usually sub in onion or sometimes leeks. Any thoughts on what would be best? Absolutely you can sub something else for the celery, K. Maybe green onions in the topping/garnish and leeks in the broth. My wife's grandmother made something similar. Thanks for including your own recipe for "chicken" stock. I liked the recipe, but I think it had too much parsley. I think next time I will switch out the parsley for kale. Thanks for sharing! I love love this recipe. I've made this three times already this month. But with varying degrees of success with the actual dumplings. Any tips? Hey G! Hmmm…Don't mix too much, and I try not to peek under the lid when they're cooking. Let us know if this helps a little!